Catherine Byron's first collection of poetry Settlements (1985) was hailed as 'a classic of Irish exile'. 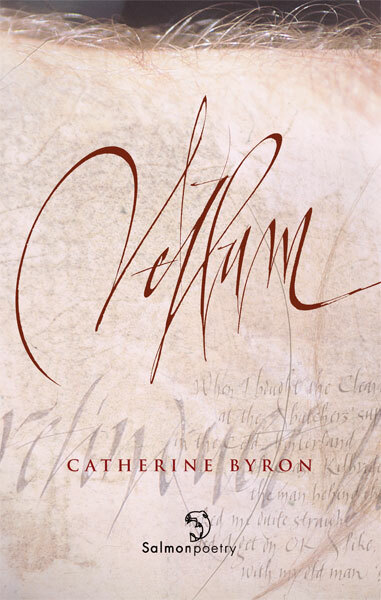 The Getting of Vellum is inspired by her ongoing creative collaboration with Dublin-based artist and calligrapher Denis Brown. The cross-fertilisation of his inscribed and distressed vellum pieces in his series The Word and Byron's poems about the slaughtering of farm animals in The Fat-Hen Field Hospital (1993) has led to the creation of new work on both vellum and glass, as well as on the printed page. Catherine Byron grew up in Belfast, raised daughters and goats in the west of Scotland, and now lives in the English Midlands. This is her sixth poetry collection. She is also the author of Out of Step: Pursuing Seamus Heaney to Purgatory (1992). She teaches writing and medieval Literature at The Nottingham Trent University. You urge me to use my blunt nail on your skin. under my index finger. 'E - I - N'. There's nothing there to see. Invisible ink. and needed a flame to turn them sepia. is burning through like on a polaroid. Thin rosy weals on the parchment of your wrist. The word I've chosen, written in my hand. "Catherine Byron is the heir to a luminous tradition, a housekeeper of souls. Her poems write themselves where they ought: on the inside of your skin." Praise for The Fat-Hen Field Hospital: "taut, brilliantly focussed... a very exact poet... hungry to enter other histories." Helen Dunmore, Poetry Review "always possessed of a strong lyric voice, Byron is remarkable for a but unsparing eye for the almost unsayable." "Catherine Byron's powerful delivery... was one of the best moments of Listowel '93."